198010 1DZ Hino 1DZ Industrial Engine Workshop (Repair) Manual. Additional information for service and repair. 198021 A09C Hino A09C Engine for 700 Series Hino Trucks Workshop (Repair) Manual. Additional information for service and repair. 198022 A09C-TE Hino A09C-TE Engine for 500 Series Hino Trucks Workshop (Repair) Manual. Additional information for service and repair. 198023 A09C-TH Hino A09C-TH Engine for 500 Series Hino Trucks Workshop (Repair) Manual. Additional information for service and repair. 198024 A09C-TI Hino A09C-TI Engine for 500 Series Hino Trucks Workshop (Repair) Manual. Additional information for service and repair. 198025 A09C-TJ Hino A09C-TJ Engine for 500 Series Hino Trucks Workshop (Repair) Manual. Additional information for service and repair. 198026 A09C-TK Hino A09C-TK Engine for 500 Series Hino Trucks Workshop (Repair) Manual. Additional information for service and repair. 198027 A09C-TU Hino A09C-TU Engine for 500 Series Hino Trucks Workshop (Repair) Manual. Additional information for service and repair. 198028 A09C-UE Hino A09C-UE Engine for 700 Series Hino Trucks Workshop (Repair) Manual. Additional information for service and repair. 198029 A09C-UK Hino A09C-UK Engine for 500 Series Hino Trucks Workshop (Repair) Manual. Additional information for service and repair. 198030 A09C-UM Hino A09C-UM Industrial Engine. Workshop (Repair) Manual. Additional information for service and repair. 198031 A09C-UN Hino A09C-UN Industrial Engine Workshop (Repair) Manual. Additional information for service and repair. 198041 ADE366 Hino ADE366 Engine for Hino Medium Duty Trucks Workshop (Repair) Manual. Additional information for service and repair. 198042 ADE366N Hino ADE366N Engine for Hino Medium Duty Trucks Workshop (Repair) Manual. Additional information for service and repair. 198043 ADE447C Hino ADE447C Engine for Hino Medium Duty Trucks Workshop (Repair) Manual. Additional information for service and repair. 198044 ADE447D Hino ADE447D Engine for Heavy Duty Trucks and Medium Duty Trucks Workshop (Repair) Manual. Additional information for service and repair. 198045 ADE447N Hino ADE447N Engine for Hino Medium Duty Trucks Workshop (Repair) Manual. Additional information for service and repair. 198046 ADE447T Hino ADE447T Engine Workshop (Repair) Manual. Additional information for service and repair. 198051 DK20-EK200 Hino DK20-EK200 Engine for Hino Buses Workshop (Repair) Manual. Additional information for service and repair. 198061 DM100 Hino DM100 Engine for Hino Buses and Hino HDT Workshop (Repair) Manual. Additional information for service and repair. 198071 DQ100 Hino DQ100 Engine for Hino Medium Duty Trucks Workshop (Repair) Manual. Additional information for service and repair. 198081 DS50 Hino DS50 Industrial Engine Workshop (Repair) Manual. Additional information for service and repair. 198082 DS70 Hino DS70 Engine - Buses, Heavy Trucks, Industrial Workshop (Repair) Manual. Additional information for service and repair. 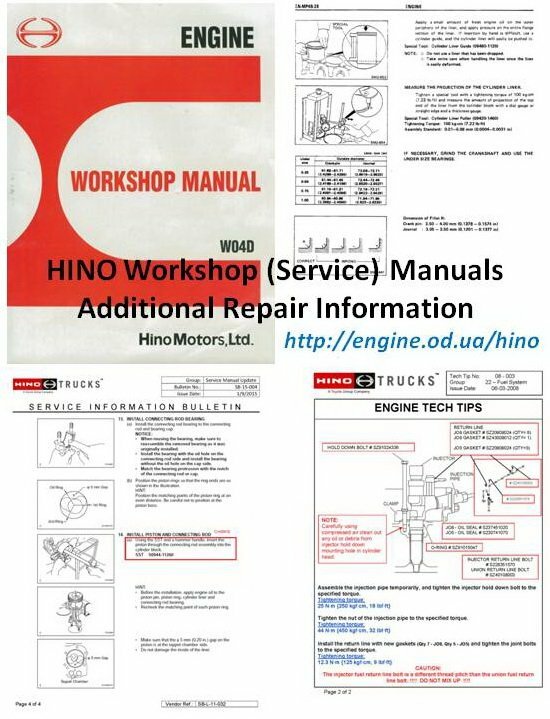 198091 E13C Hino E13C Workshop (Repair) Manual. Additional information for service and repair. 198092 E13C-TJ Hino E13C-TJ Engine for Hino 700 Series Workshop (Repair) Manual. Additional information for service and repair. 198093 E13C-TK Hino E13C-TK Engine for Hino 700 Series Workshop (Repair) Manual. Additional information for service and repair. 198094 E13C-TL Hino E13C-TL Engine for Hino 700 Series Workshop (Repair) Manual. Additional information for service and repair. 198095 E13C-TM Hino E13C-TM Engine for Hino 700 Series Workshop (Repair) Manual. Additional information for service and repair. 198096 E13C-TN Hino E13C-TN Engine for Hino 700 Series Workshop (Repair) Manual. Additional information for service and repair. 198097 E13C-TP Hino E13C-TP Engine for Hino 700 Series Workshop (Repair) Manual. Additional information for service and repair. 198098 E13C-TR Hino E13C-TR Engine for Hino 700 Series Workshop (Repair) Manual. Additional information for service and repair. 198099 E13C-TS Hino E13C-TS Engine for Hino 700 Series Workshop (Repair) Manual. Additional information for service and repair. 198100 E13C-TT Hino E13C-TT Engine for Hino 700 Series Workshop (Repair) Manual. Additional information for service and repair. 198101 E13C-UK Hino E13C-UK Engine for Hino 700 Series Workshop (Repair) Manual. Additional information for service and repair. 198102 E13C-UL Hino E13C-UL Engine for Hino 700 Series Workshop (Repair) Manual. Additional information for service and repair. 198103 E13C-UN Hino E13C-UN Engine for Hino 700 Series Workshop (Repair) Manual. Additional information for service and repair. 198104 E13C-UP Hino E13C-UP Engine for Hino 700 Series Workshop (Repair) Manual. Additional information for service and repair. 198105 E13C-UR Hino E13C-UR Engine for Hino 700 Series Workshop (Repair) Manual. Additional information for service and repair. 198106 E13C-US Hino E13C-US Engine for Hino 700 Series Workshop (Repair) Manual. Additional information for service and repair. 198107 E13C-UT Hino E13C-UT Engine for Hino Buses Workshop (Repair) Manual. Additional information for service and repair. 198108 E13C-UU Hino E13C-UU Engine for Hino Buses Workshop (Repair) Manual. Additional information for service and repair. 198109 E13C-UY Hino E13C-UY Engine for Hino 700 Series Workshop (Repair) Manual. Additional information for service and repair. 198110 E13C-VA Hino E13C-VA Engine for Hino 700 Series Workshop (Repair) Manual. Additional information for service and repair. 198111 E13C-VB Hino E13C-VB Engine for Hino 700 Series Workshop (Repair) Manual. Additional information for service and repair. 198112 E13C-VC Hino E13C-VC Engine for Hino 700 Series Workshop (Repair) Manual. Additional information for service and repair. 198113 E13C-VD Hino E13C-VD Engine for Hino 700 Series Workshop (Repair) Manual. Additional information for service and repair. 198114 E13C-VE Hino E13C-VE Engine for Hino 700 Series Workshop (Repair) Manual. Additional information for service and repair. 198115 E13C-VF Hino E13C-VF Engine for Hino 700 Series Workshop (Repair) Manual. Additional information for service and repair. 198116 E13C-VG Hino E13C-VG Engine for Hino 700 Series Workshop (Repair) Manual. Additional information for service and repair. 198117 E13C-VT Hino E13C-VT Engine for Hino 700 Series Workshop (Repair) Manual. Additional information for service and repair. 198118 E13C-VU Hino E13C-VU Engine for Hino 700 Series Workshop (Repair) Manual. Additional information for service and repair. 198119 E13C-WA Hino E13C-WA Engine for Hino 700 Series Workshop (Repair) Manual. Additional information for service and repair. 198120 E13C-WB Hino E13C-WB Engine for Hino 700 Series Workshop (Repair) Manual. Additional information for service and repair. 198121 E13C-WD Hino E13C-WD Engine for Hino 700 Series Workshop (Repair) Manual. Additional information for service and repair. 198122 E13C-WH Hino E13C-WH Engine for Hino 700 Series Workshop (Repair) Manual. Additional information for service and repair. 198123 E13C-WJ Hino E13C-WJ Engine for Hino 700 Series Workshop (Repair) Manual. Additional information for service and repair. 198124 E13C-WK Hino E13C-WK Engine for Hino 700 Series Workshop (Repair) Manual. Additional information for service and repair. 198125 E13C-WL Hino E13C-WL Engine for Hino 700 Series Workshop (Repair) Manual. Additional information for service and repair. 198126 E13C-WP Hino E13C-WP Engine for Hino 700 Series Workshop (Repair) Manual. Additional information for service and repair. 198127 E13C-WR Hino E13C-WR Engine for Hino 700 Series Workshop (Repair) Manual. Additional information for service and repair. 198128 E13C-WS Hino E13C-WS Engine for Hino 700 Series Workshop (Repair) Manual. Additional information for service and repair. 198129 E13C-WT Hino E13C-WT Engine for Hino 700 Series Workshop (Repair) Manual. Additional information for service and repair. 198130 E13C-WU Hino E13C-WU Engine for Hino 700 Series Workshop (Repair) Manual. Additional information for service and repair. 198131 E13C-WV Hino E13C-WV Engine for Hino 700 Series Workshop (Repair) Manual. Additional information for service and repair. 198132 E13C-YU Hino E13C-YU Engine for Hino 700 Series Workshop (Repair) Manual. Additional information for service and repair. 198141 EB300 Hino EB300 Engine for Heavy Duty Trucks Workshop (Repair) Manual. Additional information for service and repair. 198142 EB400 Hino EB400 Engine for Buses Workshop (Repair) Manual. Additional information for service and repair. 198143 EC100 Hino EC100 Industrial Engine and Medium Duty Trucks Workshop (Repair) Manual. Additional information for service and repair. 198144 ED100 Hino ED100 Engine for Buses and MDT Workshop (Repair) Manual. Additional information for service and repair. 198145 EF100 Hino EF100 Engine for Heavy Duty Trucks Workshop (Repair) Manual. Additional information for service and repair. 198146 EF500 Hino EF500 Engine for Buses and HDT Workshop (Repair) Manual. Additional information for service and repair. 198147 EF750 Hino EF750 Engine for Heavy Duty Trucks and Buses Workshop (Repair) Manual. Additional information for service and repair. 198148 EF750-T Hino EF750-T Engine for Heavy Duty Trucks Workshop (Repair) Manual. Additional information for service and repair. 198149 EH100 Hino EH100 Engine for Hino Medium Duty Trucks and Hino Buses Workshop (Repair) Manual. Additional information for service and repair. 198150 EH700 Hino EH700 Engine for Buses, MDT and Industrial Workshop (Repair) Manual. Additional information for service and repair. 198151 EK100 Hino EK100 Engine for HDT, MDT, Buses and Industrial Workshop (Repair) Manual. Additional information for service and repair. 198152 EK200 Hino EK200 Engine for Hino Buses Workshop (Repair) Manual. Additional information for service and repair. 198153 EM100 Hino EM100 Engine for Buses, Industrial, MDT and HDT Workshop (Repair) Manual. Additional information for service and repair. 198154 EP100 Hino EP100 Engine for Hino Buses, HDT, Industrial Workshop (Repair) Manual. Additional information for service and repair. 198155 EP100-T Hino EP100-T Industrial Engine Workshop (Repair) Manual. Additional information for service and repair. 198156 ER100 Hino ER100 Industrial Engine Workshop (Repair) Manual. Additional information for service and repair. 198157 ER200 Hino ER200 Engine for Hino Buses and Hino Medium Duty Trucks Workshop (Repair) Manual. Additional information for service and repair. 198161 F17C Hino F17C Engine for HDT Workshop (Repair) Manual. Additional information for service and repair. 198162 F17E Hino F17E Engine for Hino Heavy Duty Trucks Workshop (Repair) Manual. Additional information for service and repair. 198163 F20C Hino F20C Engine for Hino Heavy Duty Truck Workshop (Repair) Manual. Additional information for service and repair. 198164 F20C-E Hino F20C-E Engine for Hino Heavy Duty Truck Workshop (Repair) Manual. Additional information for service and repair. 198165 F20C-F Hino F20C-F Engine for Hino Heavy Duty Truck Workshop (Repair) Manual. Additional information for service and repair. 198166 F21C Hino F21C Engine for Hino Heavy Duty Truck Workshop (Repair) Manual. Additional information for service and repair. 198171 GSA45KA-XMS Hino GSA45KA-XMS Engine for Hino Medium Duty Truck Workshop (Repair) Manual. Additional information for service and repair. 198181 H06C-T Hino H06C-T Engine for Hino Buses, Hino Medium Duty Trucks Workshop (Repair) Manual. Additional information for service and repair. 198182 H06C-TI Hino H06C-TI Engine for Hino Medium Duty Trucks Workshop (Repair) Manual. Additional information for service and repair. 198183 H06C-TJ Hino H06C-TJ Engine for Hino Medium Duty Trucks Workshop (Repair) Manual. Additional information for service and repair. 198184 H06C-TL Hino H06C-TL Engine for Hino Medium Duty Trucks Workshop (Repair) Manual. Additional information for service and repair. 198185 H06C-TM Hino H06C-TM Engine for Hino Medium Duty Trucks Workshop (Repair) Manual. Additional information for service and repair. 198186 H06C-TN Hino H06C-TN Engine for Hino Medium Duty Trucks Workshop (Repair) Manual. Additional information for service and repair. 198187 H06C-TP Hino H06C-TP Engine for Hino Medium Duty Trucks Workshop (Repair) Manual. Additional information for service and repair. 198188 H06C-TT Hino H06C-TT Engine for Hino Medium Duty Trucks Workshop (Repair) Manual. Additional information for service and repair. 198189 H06C-TU Hino H06C-TU Engine for Hino Medium Duty Trucks Workshop (Repair) Manual. Additional information for service and repair. 198190 H06C-TV Hino H06C-TV Engine for Hino Medium Duty Trucks Workshop (Repair) Manual. Additional information for service and repair. 198191 H07C Hino H07C Engine for Hino Buses and Hino Medium Duty Trucks Workshop (Repair) Manual. Additional information for service and repair. 198192 H07C-E Hino H07C-E Engine for Hino Medium Duty Trucks Workshop (Repair) Manual. Additional information for service and repair. 198193 H07C-F Hino H07C-F Engine for Hino Medium Duty Trucks Workshop (Repair) Manual. Additional information for service and repair. 198194 H07C-T Hino H07C-T Engine for Hino Medium Duty Trucks Workshop (Repair) Manual. Additional information for service and repair. 198195 H07C-TA Hino H07C-TA Engine for Hino Buses Workshop (Repair) Manual. Additional information for service and repair. 198196 H07D Hino H07D Engine for Buses and Hino Medium Duty Trucks Workshop (Repair) Manual. Additional information for service and repair. 198197 H07D-A Hino H07D-A Engine for Hino Buses Workshop (Repair) Manual. Additional information for service and repair. 198201 J05C Hino J05C Engine for Hino Medium Duty Trucks Workshop (Repair) Manual. Additional information for service and repair. 198202 J05C-B Hino J05C-B Engine for Hino Medium Duty Trucks Workshop (Repair) Manual. Additional information for service and repair. 198203 J05C-TB Hino J05C-TB Engine for Hino Medium Duty Trucks Workshop (Repair) Manual. Additional information for service and repair. 198204 J05C-TD Hino J05C-TD Engine for Hino Medium Duty Trucks Workshop (Repair) Manual. Additional information for service and repair. 198205 J05C-TE Hino J05C-TE Engine for Hino Buses, Hino Medium Duty Trucks Workshop (Repair) Manual. Additional information for service and repair. 198206 J05C-TF Hino J05C-TF Engine for 500 Series, Buses, Medium Duty Trucks Workshop (Repair) Manual. Additional information for service and repair. 198207 J05C-TI Hino J05C-TI Engine for Hino Medium Duty Trucks Workshop (Repair) Manual. Additional information for service and repair. 198208 J05C-TJ Hino J05C-TJ Engine for Hino 500 Series, Hino Medium Duty Trucks Workshop (Repair) Manual. Additional information for service and repair. 198209 J05C-TV Hino J05C-TV Engine for Hino 500 Series Workshop (Repair) Manual. Additional information for service and repair. 198210 J05D-TA Hino J05D-TA Engine for Hino Mediun Duty Trucks Workshop (Repair) Manual. Additional information for service and repair. 198211 J05D-TF Hino J05D-TF Engine for Hino 300 Series Workshop (Repair) Manual. Additional information for service and repair. 198212 J05D-TG Hino J05D-TG Engine for Hino 500 Series, Hino Buses Workshop (Repair) Manual. Additional information for service and repair. 198213 J05E-TC Hino J05E-TC Engine for Hino 500 Series, Hino Buses Workshop (Repair) Manual. Additional information for service and repair. 198214 J05E-TD Hino J05E-TD Engine for Hino 300 Series, Hino 500 Series Workshop (Repair) Manual. Additional information for service and repair. 198215 J05E-TE Hino J05E-TE Engine for Hino 500 Series Workshop (Repair) Manual. Additional information for service and repair. 198216 J05E-TF Hino J05E-TF Engine for Hino Industrial, Hino Buses Workshop (Repair) Manual. Additional information for service and repair. 198217 J05E-TI Hino J05E-TI Engine for Hino 500 Series, Hino Buses Workshop (Repair) Manual. Additional information for service and repair. 198218 J05E-TP Hino J05E-TP Engine for Hino 300 Series Workshop (Repair) Manual. Additional information for service and repair. 198219 J05E-TP Hino J05E-TP Engine for Hino 300 Series Workshop (Repair) Manual. Additional information for service and repair. 198220 J05E-TY Hino J05E-TY Engine for Hino 500 Series, Hino Buses Workshop (Repair) Manual. Additional information for service and repair. 198221 J05E-UA Hino J05E-UA Engine for Hino Buses Workshop (Repair) Manual. Additional information for service and repair. 198222 J05E-UH Hino J05E-UH Engine for Hino 300 Series Workshop (Repair) Manual. Additional information for service and repair. 198223 J05E-UJ Hino J05E-UJ Engine for Hino 300 Series Workshop (Repair) Manual. Additional information for service and repair. 198224 J05E-UK Hino J05E-UK Engine for Hino 300 Series Workshop (Repair) Manual. Additional information for service and repair. 198225 J05E-UL Hino J05E-UL Engine for Hino 300 Series Workshop (Repair) Manual. Additional information for service and repair. 198226 J05E-UP Hino J05E-UP Engine for Hino 500 Series Workshop (Repair) Manual. Additional information for service and repair. 198227 J07C-B Hino J07C-B Engine for Hino 500 Series, Hino Medium Duty Trucks Workshop (Repair) Manual. Additional information for service and repair. 198228 J07E-TN Hino J07E-TN Engine for Hino 500 Series Workshop (Repair) Manual. Additional information for service and repair. 198229 J07E-TP Hino J07E-TP Engine for Hino 500 Series Workshop (Repair) Manual. Additional information for service and repair. 198230 J07E-TR Hino J07E-TR Engine for Hino Buses, Hino 500 Series Workshop (Repair) Manual. Additional information for service and repair. 198231 J08C Hino J08C Engine for Hino Industrial, Hino Medium Duty Truck Workshop (Repair) Manual. Additional information for service and repair. 198232 J08C-E Hino J08C-E Engine for Hino Medium Duty Truck Workshop (Repair) Manual. Additional information for service and repair. 198233 J08C-F Hino J08C-F Engine for Hino 500 Series, Hino Buses, Hino Medium Duty Truck Workshop (Repair) Manual. Additional information for service and repair. 198234 J08C-NC Hino J08C-NC Engine for Hino Buses Workshop (Repair) Manual. Additional information for service and repair. 198235 J08C-P Hino J08C-P Engine for Hino Industrial Workshop (Repair) Manual. Additional information for service and repair. 198236 J08C-T Hino J08C-T Engine for Hino 500 Series Workshop (Repair) Manual. Additional information for service and repair. 198237 J08C-TD Hino J08C-TD Engine for Hino Medium Duty Truck Workshop (Repair) Manual. Additional information for service and repair. 198238 J08C-TF Hino J08C-TF Engine for Hino Buses, Hino Medium Duty Truck Workshop (Repair) Manual. Additional information for service and repair. 198239 J08C-TG Hino J08C-TG Engine for Hino 500 Series, Hino Medium Duty Truck Workshop (Repair) Manual. Additional information for service and repair. 198240 J08C-TI Hino J08C-TI Engine for Hino 500 Series, Hino Buses, Hino Industrial, Hino Medium Duty Truck Workshop (Repair) Manual. Additional information for service and repair. 198241 J08C-TJ Hino J08C-TJ Engine for Hino Medium Duty Truck Workshop (Repair) Manual. Additional information for service and repair. 198242 J08C-TK Hino J08C-TK Engine for Hino Buses Workshop (Repair) Manual. Additional information for service and repair. 198243 J08C-TP Hino J08C-TP Engine for Hino Buses, Hino Medium Duty Truck Workshop (Repair) Manual. Additional information for service and repair. 198244 J08C-TR Hino J08C-TR Engine for Hino Buses Workshop (Repair) Manual. Additional information for service and repair. 198245 J08C-TS Hino J08C-TS Engine for Hino 500 Series, Hino Buses, Hino Medium Duty Truck Workshop (Repair) Manual. Additional information for service and repair. 198246 J08C-TT Hino J08C-TT Engine for Hino 500 Series, Hino Medium Duty Truck Workshop (Repair) Manual. Additional information for service and repair. 198247 J08C-TU Hino J08C-TU Engine for Hino Medium Duty Truck Workshop (Repair) Manual. Additional information for service and repair. 198248 J08C-TV Hino J08C-TV Engine for Hino Medium Duty Truck Workshop (Repair) Manual. Additional information for service and repair. 198249 J08C-TW Hino J08C-TW Engine for Hino 500 Series, Hino Medium Duty Truck Workshop (Repair) Manual. Additional information for service and repair. 198250 J08C-UG Hino J08C-UG Engine for Hino Medium Duty Truck Workshop (Repair) Manual. Additional information for service and repair. 198251 J08C-UJ Hino J08C-UJ Engine for Hino 500 Series, Hino Medium Duty Truck Workshop (Repair) Manual. Additional information for service and repair. 198252 J08C-UK Hino J08C-UK Engine for Hino 500 Series, Hino Buses, Hino Medium Duty Truck Workshop (Repair) Manual. Additional information for service and repair. 198253 J08C-UL Hino J08C-UL Engine for Hino 500 Series, Hino Medium Duty Truck Workshop (Repair) Manual. Additional information for service and repair. 198254 J08C-UM Hino J08C-UM Engine for Hino 500 Series, Hino Medium Duty Truck Workshop (Repair) Manual. Additional information for service and repair. 198255 J08C-UW Hino J08C-UW Engine for Hino Industrial Workshop (Repair) Manual. Additional information for service and repair. 198256 J08C-VC Hino J08C-VC Engine for Hino Buses Workshop (Repair) Manual. Additional information for service and repair. 198257 J08C-VD Hino J08C-VD Engine for Hino 500 Series Workshop (Repair) Manual. Additional information for service and repair. 198258 J08C-VE Hino J08C-VE Engine for Hino 500 Series Workshop (Repair) Manual. Additional information for service and repair. 198259 J08C-VF Hino J08C-VF Engine for Hino 500 Series Workshop (Repair) Manual. Additional information for service and repair. 198260 J08C-W Hino J08C-W Engine for Hino Industrial Workshop (Repair) Manual. Additional information for service and repair. 198261 J08E-TA Hino J08E-TA Engine for Hino Buses, Hino Mediun Duty Truck Workshop (Repair) Manual. Additional information for service and repair. 198262 J08E-TB Hino J08E-TB Engine for Hino 500 Series, Hino Buses, Hino Mediun Duty Truck Workshop (Repair) Manual. Additional information for service and repair. 198263 J08E-TE Hino J08E-TE Engine for Hino 500 Series, Hino Buses Workshop (Repair) Manual. Additional information for service and repair. 198264 J08E-TI Hino J08E-TI for Hino 500 Series, Hino Mediun Duty Truck Workshop (Repair) Manual. Additional information for service and repair. 198265 J08E-TL Hino J08E-TL Engine for Hino 500 Series, Hino Industrial Workshop (Repair) Manual. Additional information for service and repair. 198266 J08E-TN Hino J08E-TN Engine for Hino Industrial Workshop (Repair) Manual. Additional information for service and repair. 198267 J08E-TT Hino J08E-TT Engine for Hino Industrial Workshop (Repair) Manual. Additional information for service and repair. 198268 J08E-TU Hino J08E-TU Engine for Hino Industrial Workshop (Repair) Manual. Additional information for service and repair. 198269 J08E-TV Hino J08E-TV Engine for Hino Mediun Duty Truck Workshop (Repair) Manual. Additional information for service and repair. 198270 J08E-TW Hino J08E-TW Engine for Hino Mediun Duty Truck Workshop (Repair) Manual. Additional information for service and repair. 198271 J08E-UA Hino J08E-UA Engine for Hino 500 Series Workshop (Repair) Manual. Additional information for service and repair. 198272 J08E-UB Hino J08E-UB Engine for Hino 500 Series, Hino Buses Workshop (Repair) Manual. Additional information for service and repair. 198273 J08E-UC Hino J08E-UC Engine for Hino 500 Series Workshop (Repair) Manual. Additional information for service and repair. 198274 J08E-UD Hino J08E-UD Engine for Hino 500 Series, Hino Buses Workshop (Repair) Manual. Additional information for service and repair. 198275 J08E-UE Hino J08E-UE Engine for Hino 500 Series Workshop (Repair) Manual. Additional information for service and repair. 198276 J08E-UF Hino J08E-UF Engine for Hino 500 Series, Hino Buses Workshop (Repair) Manual. Additional information for service and repair. 198277 J08E-UG Hino J08E-UG Engine for Hino 500 Series, Hino Buses Workshop (Repair) Manual. Additional information for service and repair. 198278 J08E-UH Hino J08E-UH Engine for Hino 500 Series, Hino Buses Workshop (Repair) Manual. Additional information for service and repair. 198279 J08E-UL Hino J08E-UL Engine for Hino Industrial Workshop (Repair) Manual. Additional information for service and repair. 198280 J08E-UR Hino J08E-UR Engine for Hino 500 Series Workshop (Repair) Manual. Additional information for service and repair. 198281 J08E-VA Hino J08E-VA Engine for Hino Industrial Workshop (Repair) Manual. Additional information for service and repair. 198282 J08E-VB Hino J08E-VB Engine for Hino Mediun Duty Truck Workshop (Repair) Manual. Additional information for service and repair. 198283 J08E-VC Hino J08E-VC Engine for Hino Mediun Duty Truck Workshop (Repair) Manual. Additional information for service and repair. 198284 J08E-VD Hino J08E-VD Engine for Hino 500 Series, Hino Buses Workshop (Repair) Manual. Additional information for service and repair. 198285 J08E-VE Hino J08E-VE Engine for Hino 500 Series Workshop (Repair) Manual. Additional information for service and repair. 198286 J08E-VJ Hino J08E-VJ Engine for Hino Industrial Workshop (Repair) Manual. Additional information for service and repair. 198287 J08E-VK Hino J08E-VK Engine for Hino Industrial Workshop (Repair) Manual. Additional information for service and repair. 198288 J08E-VL Hino J08E-VL Engine for Hino Industrial Workshop (Repair) Manual. Additional information for service and repair. 198289 J08E-VN Hino J08E-VN Engine for Hino Buses Workshop (Repair) Manual. Additional information for service and repair. 198290 J08E-VT Hino J08E-VT Engine for Hino 500 Series, Hino Buses Workshop (Repair) Manual. Additional information for service and repair. 198291 J08E-VU Hino J08E-VU Engine for Hino 500 Series Workshop (Repair) Manual. Additional information for service and repair. 198292 J08E-WA Hino J08E-WA Engine for Hino 500 Series Workshop (Repair) Manual. Additional information for service and repair. 198293 J08E-WB Hino J08E-WB Engine for Hino 500 Series Workshop (Repair) Manual. Additional information for service and repair. 198294 J08E-WH Hino J08E-WH Engine for Hino 500 Series Workshop (Repair) Manual. Additional information for service and repair. 198295 J08E-WJ Hino J08E-WJ Engine for Hino 500 Series Workshop (Repair) Manual. Additional information for service and repair. 198296 J08E-WK Hino J08E-WK Engine for Hino 500 Series Workshop (Repair) Manual. Additional information for service and repair. 198297 J08E-WL Hino J08E-WL Engine for Hino 500 Series Workshop (Repair) Manual. Additional information for service and repair. 198298 J08E-WM Hino J08E-WM Engine for Hino 500 Series Workshop (Repair) Manual. Additional information for service and repair. 198301 K13C Hino K13C Engine for Hino Heavy Duty Truck Workshop (Repair) Manual. Additional information for service and repair. 198302 K13C-T Hino K13C-T Engine for Industrial Workshop (Repair) Manual. Additional information for service and repair. 198303 K13C-TF Hino K13C-TF Engine for Hino Heavy Duty Truck Workshop (Repair) Manual. Additional information for service and repair. 198304 K13C-TJ Hino K13C-TJ Hino Industrial Engine Workshop (Repair) Manual. Additional information for service and repair. 198305 K13C-TK Hino K13C-TK Engine for Hino Heavy Duty Truck Workshop (Repair) Manual. Additional information for service and repair. 198306 K13C-TM Hino K13C-TM Engine for Hino Heavy Duty Truck Workshop (Repair) Manual. Additional information for service and repair. 198307 K13D Hino K13D Hino Buses Engine, Hino Heavy Duty Trucks, Hino Medium Duty Trucks Workshop (Repair) Manual. Additional information for service and repair. 198308 K13D-K Hino K13D-K Hino Buses Engine Workshop (Repair) Manual. Additional information for service and repair. 198309 K13D-T Hino K13D-T Hino Industrail Engine Workshop (Repair) Manual. Additional information for service and repair. 198310 K13E-T Hino K13E-T Hino Industrial Engine Workshop (Repair) Manual. Additional information for service and repair. 198311 K13U Hino K13U Hino Buses Engine Workshop (Repair) Manual. Additional information for service and repair. 198321 M10C Hino M10C Engine for Hino Medium Duty Trucks Workshop (Repair) Manual. Additional information for service and repair. 198331 N042-TA Hino N042-TA Hino Industrial Engine Workshop (Repair) Manual. Additional information for service and repair. 198332 N04C Hino N04C Hino 300 Series Engine Workshop (Repair) Manual. Additional information for service and repair. 198333 N04C-TE Hino N04C-TE Hino 300 Series Engine Workshop (Repair) Manual. Additional information for service and repair. 198334 N04C-TF Hino N04C-TF Engine for Hino Light Duty Trucks and Hino 300 Series Workshop (Repair) Manual. Additional information for service and repair. 198335 N04C-TJ Hino N04C-TJ Engine Workshop (Repair) Manual. Additional information for service and repair. 198336 N04C-TK Hino N04C-TK Engine Workshop (Repair) Manual. Additional information for service and repair. 198337 N04C-TN Hino N04C-TN Hino 300 Series Engine Workshop (Repair) Manual. Additional information for service and repair. 198338 N04C-TR Hino N04C-TR Hino 300 Series Engine Workshop (Repair) Manual. Additional information for service and repair. 198339 N04C-TS Hino N04C-TS Hino 300 Series Engine Workshop (Repair) Manual. Additional information for service and repair. 198340 N04C-TT Hino N04C-TT Hino Buses Engine and Hino 300 Series Workshop (Repair) Manual. Additional information for service and repair. 198341 N04C-TU Hino N04C-TU Hino 300 Series Engine Workshop (Repair) Manual. Additional information for service and repair. 198342 N04C-TV Hino N04C-TV Hino 300 Series Engine Workshop (Repair) Manual. Additional information for service and repair. 198343 N04C-TW Hino N04C-TW Hino 300 Series Engine Workshop (Repair) Manual. Additional information for service and repair. 198344 N04C-UE Hino N04C-UE Hino 300 Series Engine Workshop (Repair) Manual. Additional information for service and repair. 198345 N04C-UH Hino N04C-UH Hino 300 Series Engine Workshop (Repair) Manual. Additional information for service and repair. 198346 N04C-UK Hino N04C-UK Hino 300 Series Engine Workshop (Repair) Manual. Additional information for service and repair. 198347 N04C-UR Hino N04C-UR Hino 300 Series Engine Workshop (Repair) Manual. Additional information for service and repair. 198348 N04C-US Hino N04C-US Hino 300 Series Engine Workshop (Repair) Manual. Additional information for service and repair. 198349 N04C-UT Hino N04C-UT Hino 300 Series Engine Workshop (Repair) Manual. Additional information for service and repair. 198350 N04C-UU Hino N04C-UU Hino 300 Series Engine Workshop (Repair) Manual. Additional information for service and repair. 198351 N04C-UV Hino N04C-UV Engine for Hino Buses and Hino 300 Series Workshop (Repair) Manual. Additional information for service and repair. 198352 N04C-UY Hino N04C-UY Hino 300 Series Engine Workshop (Repair) Manual. Additional information for service and repair. 198353 N04C-VA Hino N04C-VA Hino 300 Series Engine Workshop (Repair) Manual. Additional information for service and repair. 198354 N04C-VB Hino N04C-VB Engine for Hino Buses and Hino 300 Series Workshop (Repair) Manual. Additional information for service and repair. 198355 N04C-VC Hino N04C-VC Hino 300 Series Engine Workshop (Repair) Manual. Additional information for service and repair. 198356 N04C-VM Hino N04C-VM Hino 300 Series Engine Workshop (Repair) Manual. Additional information for service and repair. 198361 P09C Hino P09C Hino Heavy Duty Trucks Engine Workshop (Repair) Manual. Additional information for service and repair. 198362 P11C Hino P11C Engine for Hino Buses, Hino Heavy Duty Trucks, Hino Industrial, Hino Medium Duty Trucks Workshop (Repair) Manual. Additional information for service and repair. 198363 P11C-TE Hino P11C-TE Engine Workshop (Repair) Manual. Additional information for service and repair. 198364 P11C-TH Hino P11C-TH Engine for Hino Buses, Hino Heavy Duty Trucks Workshop (Repair) Manual. Additional information for service and repair. 198365 P11C-TI Hino P11C-TI Engine for Hino 500-Series, Hino Industrial Workshop (Repair) Manual. Additional information for service and repair. 198366 P11C-TJ Hino P11C-TJ Engine for Hino Buses, Hino Heavy Duty Trucks Workshop (Repair) Manual. Additional information for service and repair. 198367 P11C-TK Hino P11C-TK Engine for Hino Heavy Duty Trucks Workshop (Repair) Manual. Additional information for service and repair. 198368 P11C-UB Hino P11C-UB Engine for Hino 500-Series, Hino Buses, Hino Heavy Duty Trucks, Hino Medium Duty Trucks Workshop (Repair) Manual. Additional information for service and repair. 198369 P11C-UG Hino P11C-UG Engine Workshop (Repair) Manual. Additional information for service and repair. 198370 P11C-UJ Hino P11C-UJ Engine for Hino 500-Series, Hino 700-Series Workshop (Repair) Manual. Additional information for service and repair. 198371 P11C-UR Hino P11C-UR Engine for Hino 700-Series Workshop (Repair) Manual. Additional information for service and repair. 198372 P11C-UV Hino P11C-UV Engine for Hino 500-Series Workshop (Repair) Manual. Additional information for service and repair. 198373 P11C-UY Hino P11C-UY Engine Workshop (Repair) Manual. Additional information for service and repair. 198374 P11C-VA Hino P11C-VA Engine for Hino 700-Series, Hino Industrial Workshop (Repair) Manual. Additional information for service and repair. 198375 P11C-VB Hino P11C-VB Engine for Hino 700-Series, Hino Industrial Workshop (Repair) Manual. Additional information for service and repair. 198376 P11C-VD Hino P11C-VD Engine Workshop (Repair) Manual. Additional information for service and repair. 198377 P11C-VE Hino P11C-VE Engine Workshop (Repair) Manual. Additional information for service and repair. 198378 P11C-VF Hino P11C-VF Engine Workshop (Repair) Manual. Additional information for service and repair. 198379 P11C-VJ Hino P11C-VJ Engine for Hino 700-Series, Hino Industrial Workshop (Repair) Manual. Additional information for service and repair. 198380 P11C-VK Hino P11C-VK Engine for Hino 700-Series, Hino Industrial Workshop (Repair) Manual. Additional information for service and repair. 198381 P11C-VL Hino P11C-VL Engine for Hino 700-Series, Hino Industrial Workshop (Repair) Manual. Additional information for service and repair. 198382 P11C-VM Hino P11C-VM Engine for Hino 700-Series Workshop (Repair) Manual. Additional information for service and repair. 198383 P11C-VP Hino P11C-VP Engine for Hino 500-Series Workshop (Repair) Manual. Additional information for service and repair. 198384 P11C-VR Hino P11C-VR Engine for Hino 500-Series Workshop (Repair) Manual. Additional information for service and repair. 198385 P11C-VU Hino P11C-VU Engine for Hino 500-Series Workshop (Repair) Manual. Additional information for service and repair. 198386 P11C-WA Hino P11C-WA Engine for Hino 500-Series Workshop (Repair) Manual. Additional information for service and repair. 198391 S05C Hino S05C Engine for Hino 300-Series, Hino Light Duty Trucks Workshop (Repair) Manual. Additional information for service and repair. 198392 S05C-B Hino S05C-B Engine for Hino 300-Series, Hino Light Duty Trucks Workshop (Repair) Manual. Additional information for service and repair. 198393 S05C-TA Hino S05C-TA Engine for Hino 300-Series, Hino Light Duty Trucks Workshop (Repair) Manual. Additional information for service and repair. 198394 S05C-TB Hino S05C-TB Engine for Hino 300-Series, Hino Light Duty Trucks Workshop (Repair) Manual. Additional information for service and repair. 198395 S05D Hino S05D Engine for Hino Light Duty Trucks Workshop (Repair) Manual. Additional information for service and repair. 198401 W04C-T Hino W04C-T Engine Hino Buses, Hino Industrial, Hino Medium Duty Truck Workshop (Repair) Manual. Additional information for service and repair. 198402 W04C-TH Hino W04C-TH Engine for Hino Medium Duty Truck Workshop (Repair) Manual. Additional information for service and repair. 198403 W04C-TM Hino W04C-TM Engine for Hino Medium Duty Truck Workshop (Repair) Manual. Additional information for service and repair. 198404 W04D Hino W04D Engine for Hino 300 Series, Hino Buses, Hino Industrial, Hino Light Duty Trucks, Hino Medium Duty Trucks Workshop (Repair) Manual. Additional information for service and repair. 198405 W04D-B Hino W04D-B Engine for Hino Medium Duty Trucks Workshop (Repair) Manual. Additional information for service and repair. 198406 W04D-D Hino W04D-D Engine for Hino Medium Duty Trucks Workshop (Repair) Manual. Additional information for service and repair. 198407 W04D-J Hino W04D-J Engine for Hino 300 Series, Hino Light Duty Trucks Workshop (Repair) Manual. Additional information for service and repair. 198408 W04D-T Hino W04D-T Engine Workshop (Repair) Manual. Additional information for service and repair. 198409 W04D-TK Hino W04D-TK Engine for Hino 300 Series, Hino Light Duty Trucks Workshop (Repair) Manual. Additional information for service and repair. 198410 W04D-TL Hino W04D-TL Engine for Hino 300 Series, Hino Light Duty Trucks Workshop (Repair) Manual. Additional information for service and repair. 198411 W04D-TM Hino W04D-TM Engine for Hino 300 Series Workshop (Repair) Manual. Additional information for service and repair. 198412 W04D-TN Hino W04D-TN Engine for Hino 300 Series, Hino Buses, Hino Medium Duty Trucks Workshop (Repair) Manual. Additional information for service and repair. 198413 W04D-TP Hino W04D-TP Engine for Hino 300 Series Workshop (Repair) Manual. Additional information for service and repair. 198414 W04D-TR Hino W04D-TR Engine for Hino 300 Series Workshop (Repair) Manual. Additional information for service and repair. 198415 W06D Hino W06D Engine for Hino Buses, Hino Industrial, Hino Medium Duty Truck Workshop (Repair) Manual. Additional information for service and repair. 198416 W06DTI Hino W06DTI Hino Industrial Engine Workshop (Repair) Manual. Additional information for service and repair. 198417 W06E Hino W06E Engine for Hino Medium Duty Truck, Hino Buses, Hino Industrial Workshop (Repair) Manual. Additional information for service and repair. 198421 H260 Hino H260 manual transmission for Hino trucks Workshop (Repair) Manual. Additional information for service and repair. 198422 H350 Hino H350 manual transmission for Hino trucks Workshop (Repair) Manual. Additional information for service and repair. 198423 M153 Hino M153 manual transmission for Hino trucks Workshop (Repair) Manual. Additional information for service and repair. 198424 M550 Hino M550 manual transmission for Hino trucks Workshop (Repair) Manual. Additional information for service and repair. 198425 MYY5A Hino MYY5A manual transmission for Hino trucks Workshop (Repair) Manual. Additional information for service and repair. 198426 MYY6S Hino MYY6S manual transmission for Hino trucks Workshop (Repair) Manual. Additional information for service and repair. 198427 MZZ6F Hino MZZ6F manual transmission for Hino trucks Workshop (Repair) Manual. Additional information for service and repair. 198428 A860E Automatic Transmission A860E for Hino trucks Workshop (Repair) Manual. Additional information for service and repair. 198429 Allison 3000, 3500 Automatic Transmission ALLISON 3000, 3500 for Hino trucks Workshop (Repair) Manual. Additional information for service and repair.